Working in pediatrics can be a lot of fun. What makes it fun is the fact that you get to “play” while working on important motor skills. 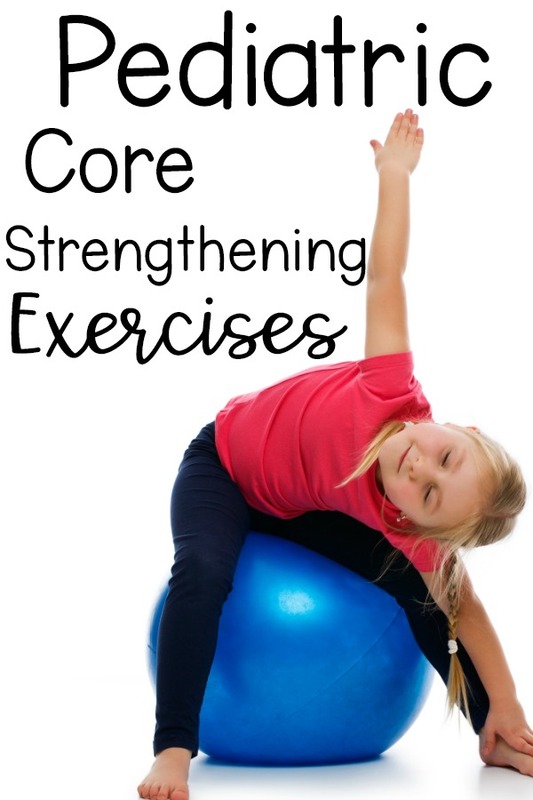 Today I’m going to share some of my favorite pediatric core strengthening exercises that are so much fun that your kiddo may not even realize how hard they are working on strengthening their core! In the following pediatric core strengthening exercises a peanut ball (affiliate link), beanie babies, balls, and bean bags are used. You may be able to look around your home and find different items that you could substitute in lieu of these. The following ideas are just some of the exercise ideas from Pink Oatmeal. Be sure to see so many more gross motor activities for kids! One of my favorite ways to work on core strengthening is with beanie baby elevator rides. Simply sit on a peanut ball or unstable surface and give your beanie baby a ride into the bucket. This requires core strength to lift the foot off the ground while maintaining stability on the peanut ball. Make it easier by pushing the peanut ball up against the wall for added stability. Another fun way to work on core strength is with stickers. The stability ball with stickers game is a blast! Work on fine motor skills in this pediatric core strengthening exercise. Use a tongs or spoon. Pick any manipulative you would like and have fun! Using your feet to roll a ball up the wall is a fun and easy way to strengthen cores in the pediatric setting. Use a piece of tape on the wall as a visual goal as to how far the ball should go. Peanut ball chops are fun and not only are they great for the core, but it is a great whole body exercise. It also works on midline crossing which is great for anyone in the pediatric setting. Find a friend and have them help you with this fun exercise. Pick any type of object you would like to try lower down into the basket. Add rotation to your exercise. This would be a great one to have a mirror in front of the kiddo as a visual when doing this exercise. Yoga -We love using different themed yoga cards for kids! Themes make it so much for fun! Get free yoga in the freebie library. What are your favorite ways to work on pediatric core strengthening?